IntelliDyne delivers insightful enterprise infrastructure management consulting that empowers clients to “Experience Above and Beyond.” With a multi-year engagement, IntelliDyne works in close partnership with Borenstein Group to enhance its digital presence and communicate its value proposition through strategic public relations. The result: consistent and measurable growth. 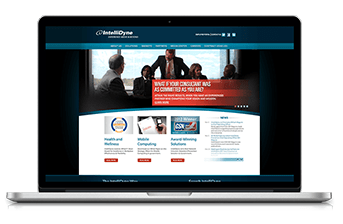 IntelliDyne, elite IT solutions consulting firm based in Northern Virginia, had operated successfully for over twelve years. The firm offered a high level of expertise, with numerous certifications and a wealth of experience. However, in the region’s highly competitive B2G IT consulting market, IntelliDyne recognized the need to distinguish itself as a trusted industry leader, and reinvent itself to align with government’s new CIO priorities such as Big Data, Cloud Computing, Healthcare IT, and Mobile Device Management. Borenstein Group implemented a full-scale branding initiative, which included a strategic benchmarking study that calibrated current market positioning versus desired growth positioning. It then proceeded, in collaboration with IntelliDyne’s leadership, to create an updated version for the logo and tagline, mission, and elevator speech; develop a cutting-edge web design; create digital and print marketing collateral; design a tradeshow booth; develop new public sector case studies and thought-leadership white papers; and implement active social media strategies. This intense and integrated approach was successful in earning new business, and earned multiple awards, including the Communicator Award, the Summit International Award, both for excellence in web design and content in B2G marketing. Tony Crescenzo, CEO of IntelliDyne, explains the ultimate business impact of Borenstein Group’s strategic approach and creative execution was helping IntelliDyne increase per-contract revenue by 800% over a two year period.